On this weeks episode of the HomeBase Podcast, I talked about some great Travel Tips for all of you traveling this summer with infants! I wanted to compile them into a list for you guys. For a more detailed account, be sure to check out the episode: Summer Fun and Travel Tips! Arm&Hammer makes a good one that will attach to your diaper bag! Line it up just right and you can see your little pumpkin while your driving down the road! 3. Dress your little munchkin in airy clothes. They are going to be confined and in the sun so let those legs and arms breathe. These window clings will help minimize the heat and reduce the glare on your little guys. whether it’s a white noise machine or a lullaby CD have it with you to help the peanuts fall asleep! If you nurse on a Boppy, bring it with you! Anything you can do to make feeding in the car easier, do it! When the crying starts, have a kid friendly fun CD on stand by to change the mood in the car. This may be a no brainer, but load them up with toys, hand them around the car to keep them occupied. The bathrooms are cleaner and you’re guaranteed to have a changing table. When you are stopped and changing the diaper do some baby yoga to get their little limbs moving. Always be safe and never text while driving! A great list here, some really good suggestions, I particularly like the idea of odor repelling trash bags.. I’m not sure you can get them here?! 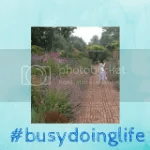 Thankyou so much for linking up with #busydoinglife again this week, it’s great to have you joining in! Great list of tips! I like the baby yoga idea a lot!